The arrival of the territorial bands in Kansas City during the late 1920s further strengthened the ranks of local 627. Union membership grew dramatically from 87 in 1927 to 327 by the end of 1930. The George Morrison Orchestra, Jesse Stone and the Blues Serenaders, Andy Kirk and the Twelve Clouds of Joys, Walter Page and the Blue Devils and the other bands hailing from the Southwest were referred to as territorial bands for the vast territories they staked out across the western United States. Based in small towns, the bands traveled a circuit of one nighters, often jumping hundreds of miles between engagements. Band leaders jealously protected their territories. A band leader wanting to play on another band leader's turf had to first obtain permission. Moten and Lee, eager to expand their spheres of influence, readily swapped territories with Kirk, Page and other band leaders from the Southwest, bringing a flood of fresh talent to Kansas City and enriching the ranks of Local 627. Over the next few years, Kansas City became a regular stop on the territorial band circuit. Andy Kirk and the Twelve Clouds of Joy and Walter Page's Blue Devils moved their headquarters to Kansas City in the late 1920s. George E. Lee, Bennie Moten and other Kansas City band leaders recruited veterans of the territorial tradition to expand and refine their bands. As the Great Depression deepened, musicians from the hard hit Southwest migrated to Kansas City in droves. New arrivals joined Local 627, causing the union to outgrow its modest headquarters in the Rialto Building at 18th and Highland. In 1930, under the leadership of William Shaw, union members established a permanent headquarters at 1823 Highland. In 1929, the union bought a plain-brick, two-story apartment building and an adjacent small house at 1823-25 Highland for its headquarters. Musicians raised the money to convert the apartment building into a headquarters with a mammoth benefit dance at Paseo Hall in early December 1929. The union fielded six bands for this first annual Musicians' Ball. The Kansas City Call reported how dance fans jam-packed Paseo Hall throughout the evening festivities, inspiring the bands to new musical heights. "The crowd did everything but hang on the ceiling. The lobby was jammed; the dance floor was jammed; the seats along the wall were jammed; and the balcony was groaning with too much population. And maybe you think those six orchestras didn't play with that sort of crowd for inspiration! There were more varieties of melody, rhythm, blues and stomp music than the old dance palace has heard in a long time. George E. Lee and his novelty singing Brunswick orchestra got the crowd in a good humor with a flawless performance. Paul Bank's nattily attired Rhythm Aces followed in a way that made everybody happy. Andy Kirk's Twelve Clouds of Joy came next with a burst of joy that made the hall rock. 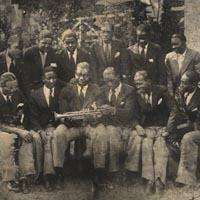 Bennie Moten's Victor recording orchestra made its large following happy with the type of music which has made it widely famous and Bennie himself got out of bed to fill this engagement. And George Wilkerson and his Musical Magnets bore up the tradition and got hot in the approved manner." The resounding financial success of the ball bankrolled the remodeling of the new headquarters. 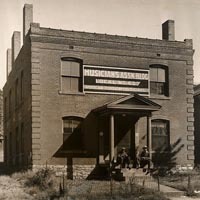 The union dedicated its new home on Sunday, May 4th, 1930 during National Music Week. A panoramic group photo of members proudly lined up in front of their new union hall commemorated the event, which included a 50-piece marching band in a street parade that began at 4:00 p.m. sharp. The following evening, May 5, the union staged a battle of the bands at Paseo Hall, pitting eight bands in a battle royal: Paul Banks' 10 Rhythm Aces versus Bill Little and His Little Bills, Elmer Payne's Music Masters against Julius Banks' Red Devils, Andy Kirk's 12 Clouds of Joy opposing Jasper Allen's Southern Troubadours, and Bennie Moten and His 14 Victor Artists battling George E. Lee and His Brunswick Recorders. The battle continued until daybreak with the combatants exchanging musical volleys from the bandstands on either side of the Hall. 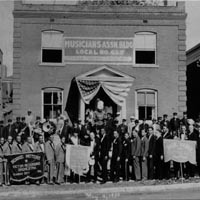 In the ensuing years, Local 627 continued to stage battles of the bands to celebrate National Music Week and other special occasions.